Circumstellar debris disks are the extrasolar analogs of our Zodiacal dust disk (< 3 AU) and the dust complex generated in the Kuiper belt (40-50 AU; ). They are optically thin and gas-poor. Debris disks arise from the collisional erosion of larger solid objects, but may include a contribution from subliming icy bodies as they pass through periastron. Debris disks offer a secondary pathway for examining planetary systems because planets are responsible for shaping the structure of the disk. For example, concentrations of dust may arise from resonant interactions with planets, and these dust clumps may be seen to rotate around the star over time as the planet proceeds along its orbit. GPI will advance debris disks science in many ways, particularly because it has the ability to analyze the polarization of light reflected from circumstellar grains. 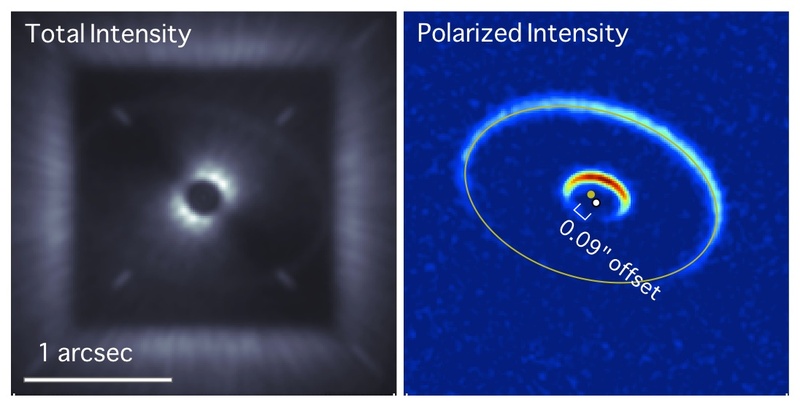 Dual channel polarimetry reveals face-on dust disks and rings. The left frame shows total intensity of a Fomalhaut belt analog, the middle panel shows Stokes Q and the right panel shows Stokes U. The animation begins with a face-on orientation and proceeds to an edge-on orientation. Polarization measurements serve the dual purpose of suppressing speckle noise (speckles produced by small-angle diffraction are unpolarized) and constraining grain properties. In other words, wavefront errors render the PSF unsuitable for detection of low surface brightness emission from a debris disk. However, light scattered by small grains [x = 2*pi*(grain size / wavelength) = 1, or smaller] in the disk is strongly polarized (> 30%), whereas light diffracted at small angles by wave front errors is only very weakly polarized. As a consequence, the astrophysical signal can be disentangled from the instrumental one. The simulation to the left demonstrates how the dust disk signal is enhanced relative to the noise by using polarimetry. High-fidelity model GPI data showing a hypothetical debris disk in scattered light. The system consists of two rings viewed at i = 60 ̊. The optical depth of each ring is is similar to HR8799 (Su et al. 2009). The outer ring has a measurable offset caused by an unseen sub-Jovian planet.